The Ryan company has been designing and sell turf care equipment for more than 60 years. Their sod cutter was created after the shop paired up with a commercial landscaper named Art Ryan. As the saying goes, history was made and these first sod cutters (named Ryan Sod Busters) can still be found in operation today. The main concept in the manufacture of the Ryan Sod Buster was to create a heavy-duty, long-lasting sod cutter that could be used commercially as well as for homeowner applications such as clearing flower beds and garden areas. Today, Ryan is still the industry leader in turf management products, from Ryan sod cutters to dethatchers and overseeders. Whether you are a professional landscaper or a do-it-yourself gardener, there is a sod cutter manufactured by Ryan to suit your needs. The following models can be purchased from Ryan product distributors the world over. Ryan Jr. Sod Cutter #544844 - this model is the smallest model available. It is self-propelled sod cutter with a 6-HP Briggs & Stratton engine. It can cut up to 135 feet per minute with an adjustable height of up to 2.5 inches. It will cut 12-inch widths of sod and weighs 340 pounds. The average price for a new machine is $3800.00. Ryan Jr. Sod Cutter #544944 - this model is similar in size to the 544844 model, but it uses a different engine. This sod cutter has a 5.5-HP Honda engine. It also cuts 12-inch widths of sod and can cut 135 feet per minute. The height is adjustable up to 2.5 inches and weighs 344 pounds. The average price for a new machine is $3980.00. Ryan Jr. Sod Cutter #544845 - this model is a slightly larger model than the 544944 model. It features a 6-HP Briggs & Stratton engine and can cut a 135-foot swath of sod in a minute. It has an adjustable cutting thickness of up to 2.5 inches and has an 18-inch cutting width. This model weighs 385 pounds and the average cost for a new machine is $4100.00. Ryan Jr. Sod Cutter #544945 - this model is similar to the 544845 model, but it uses a 5.5-HP Honda engine. It can also cut 135 feet of sod per minute and has an adjustable cutting thickness of up to 2.5 inches. It has an 18-inch cutting width and weighs 385 pounds. The average price for this model is $4300.00. The price of a sod cutter may be cost prohibitive to some individuals who know they won't be spending a lot of time cutting up sod on a regular basis. For the commercial landscaper though, the product is the right size, usually the right price and can easily pay for itself within a year. For the average homeowner or individual with a small amount of property, renting is a better option. Sod cutters require a lot of regular maintenance and because of this, renting can save the homeowner a great deal of money. 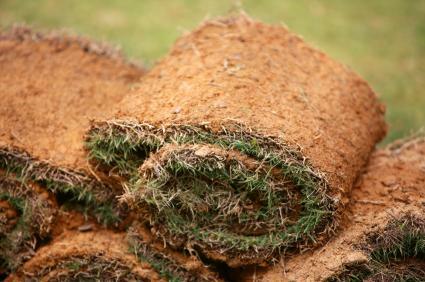 The average cost to rent a sod cutter is approximately $90 per day. Most tool rental centers will also rent out this equipment for a half-day, which will save a homeowner even more money. However, be sure to get complete operating instructions before you leave the rental center. It is frustrating to get a piece of rental equipment home and then be unable to get it running. A sod cutter is about as difficult to operate as a push lawn mower or a Rototiller. If you have experience with either of these, a sod cutter won't intimidate you. Ryan sod cutters are self-propelled, which means it will almost do all of the work for you- no strenuous pushing required. They turn easily and will clear a piece of ground quickly so you should be able to finish most projects in a half-day or in one 24-hour period. If you've ever had trouble clearing an area for your garden or simply want to put in a new sidewalk in front of your house, consider buying or renting a sod cutter for the project. It will save you both time and money.